Play Tower of Hanoi Online. 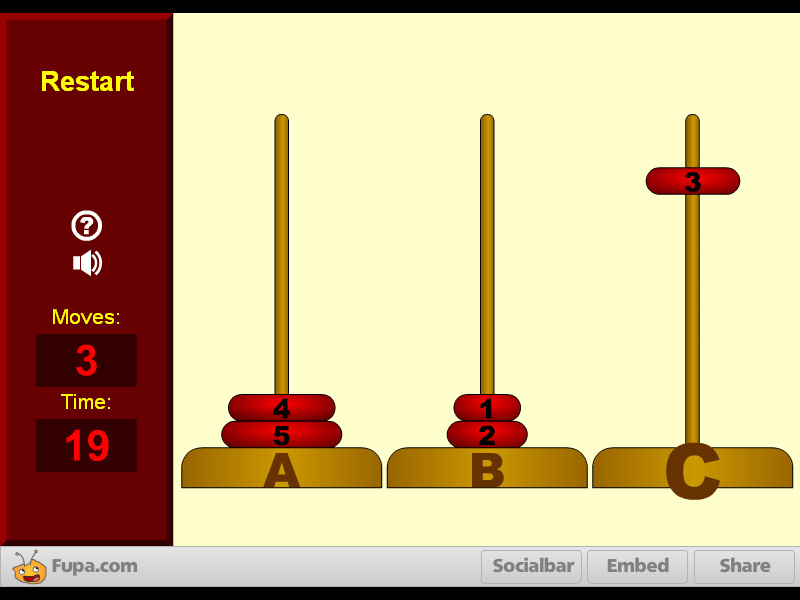 "Tower of Hanoi" is a free online logic game to resort movable rings on different pins. Play Tower of Hanoi online on computer. Classic logic game. Fun logic learning game. Move all rings from one side to another. 3 rings game - easiest. 10 rings game - hardest. How to play Tower of Hanoi. This is a classic Hanoi Tower game made by Fupa.com. The player must move a number of rings from one pi (tower) to another in the same order. Detailed rules are described in the Class subjects section. 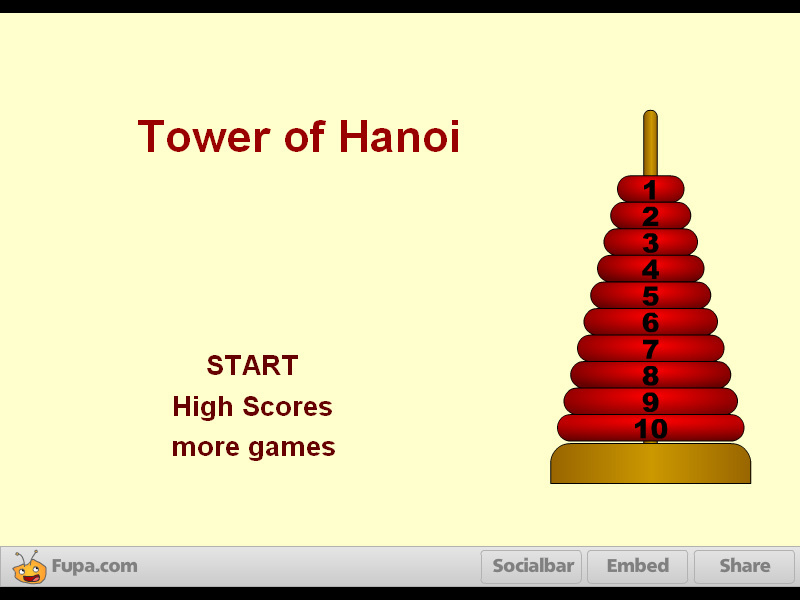 Know how to win a Tower of Hanoi game. The Tower of Hanoi (also called the Tower of Brahma or Lucas' Tower and sometimes pluralized) is a mathematical game or puzzle. It consists of three rods and a number of disks of different sizes, which can slide onto any rod. The puzzle starts with the disks in a neat stack in ascending order of size on one rod, the smallest at the top, thus making a conical shape. The objective of the puzzle is to move the entire stack to another rod, obeying the following simple rules: 1. Only one disk can be moved at a time. 2.Each move consists of taking the upper disk from one of the stacks and placing it on top of another stack or on an empty rod. 3. No larger disk may be placed on top of a smaller disk. With 3 disks, the puzzle can be solved in 7 moves. The minimal number of moves required to solve a Tower of Hanoi puzzle is 2(exponent)n ? 1, where n is the number of disks. Labels: Classic Games , Puzzle Games , Learning Games , Logic Games , Education Games , Free Online Games.